Rebecca Holcombe was the daughter of Reuben Wetmore Holcombe and Rebecca Niles. Reuben W. Holcombe was born in 1825 at OH.1 He was the son of Reuben Wetmore Holcombe and Rebecca Niles. Reuben W. Holcombe died in 1895. Reubin W. and Martha were enumerated in the 1850 Huntington, Gallia Co. OH, federal census. He was a farmer agae 25, she was 24. Children in the household were Elizabeth 5, and Sarah 2. Reubin and Matilda wre enumerated in the 1860 Huntington, Gallia Co., OH, federal census. He was a farmer age 35, she was 34. This is apparently a blended family. Children in the household were Elizabeth 16 and Sarah 12; then Isaac Bermas 9 and Elizabeth Bermas 5; then Mary E. Holcomb 4 months. Ruby Holcombe married Morris Fullerton. Ruby Holcombe was born in 1839. She was the daughter of Amos Niles Holcombe and Martha Wilds. Ruby Holcombe died in 1887. Morris Fullerton married Ruby Holcombe, daughter of Amos Niles Holcombe and Martha Wilds. Thomas Riley Holcombe was born on 22 August 1841 at Gallia Co., OH. He was the son of Amos Niles Holcombe and Martha Wilds. Thomas Riley Holcombe died in 1862. Killed in Civil War. Horace Holcombe was born in 1843. He was the son of Amos Niles Holcombe and Martha Wilds. Horace Holcombe died in 1863. Victoria Holcombe was born in 1845. She was the daughter of Amos Niles Holcombe and Martha Wilds. Hiram Niles Holcombe was born on 19 October 1847 at Jackson Co., OH. He was the son of Amos Niles Holcombe and Martha Wilds. Hiram Niles Holcombe married Samantha Fullerton circa 1868. Hiram Niles Holcombe died on 25 December 1928 at Lake View Twp., Becker Co., MN, at age 81. California Holcombe was born in 1850. He was the son of Amos Niles Holcombe and Martha Wilds. California Holcombe died in 1874. Moved to Montana. Coombs Holcombe was born in 1852. He was the son of Amos Niles Holcombe and Martha Wilds. Abner J. Holcombe was born in 1854. He was the son of Amos Niles Holcombe and Martha Wilds. Abner J. Holcombe died in 1914. Reuben Holcombe was born in 1856. He was the son of Amos Niles Holcombe and Martha Wilds. Amanda Holcombe was born in 1859. She was the daughter of Amos Niles Holcombe and Martha Wilds. Amos Burlington Holcombe died in 1861. He was born in 1861. He was the son of Amos Niles Holcombe and Martha Wilds. Grandvile M. Holcombe was born in 1867. He was the son of Amos Niles Holcombe and Lovina Brownley. Grandvile M. Holcombe died in 1947. MN death certificate 1947-MN-008770 indicates that Granville Moody Holcombe d. 12/03/1947 McLeod Co., MN. Oscar Holcombe was born in 1868. He was the son of Amos Niles Holcombe and Lovina Brownley. Oscar Holcombe died in 1914. Elisa A. Holcombe was born in 1871. She was the daughter of Amos Niles Holcombe and Lovina Brownley. Elisa A. Holcombe died in 1940. [S506] Leroy E. Higley, John Higley, Page 2. Probably born in NY but recorded at Granby, CT. His middle initial is reported as 'A' in the 1830 census and various land records, but his great grandson gives his middle name as Truman. Living next to JOnah and Chauncey Holcomb in 1830, he resided at Orangeville and Sheldon (1850), Wyoming Co., NY. Jonah A. Holcombe married Hannah (?) Jonah A. Holcombe was born on 3 January 1799 at probably NY. He was the son of Jonah Holcombe and Sabra (?) Jonah A. Holcombe died on 22 January 1854 at age 55. Hannah (?) married Jonah A. Holcombe, son of Jonah Holcombe and Sabra (?). Hannah (?) was born in 1801. She died on 24 February 1850. Harriet Holcombe was born on 31 December 1810 at Varysburg, Genesee (now Wyoming) Co., NY. She was the daughter of Jonah Holcombe and Sabra (?) Harriet Holcombe married Henry L. Andrews before 1835. Harriet Holcombe died on 15 September 1892 at Johnsonburg, Wyoming Co., NY, at age 81. Asahel Holcombe was born on 12 November 1742. He was the son of John Holcombe and Mary Kent. Asahel Holcombe died on 1 June 1816 at age 73. There is duplication of Asahels by the genealogists. McCracken places this Asahel (1742-1816) here. Seaver and Bowman place him as a son of Ashel Esq (1720-1817). This report will continue the line under Ashel Esq. (1720-1817), but leave this entry to point out the possible error by McCracken. McPherson indicates that Roswell and Poly had 10 children but only lists 7. [S23] Jesse Seaver, The Holcomb(e) Genealogy, Page 47:Item 211.1.II. [S205] Albert Carlos Bates, Records of the Congregational Church in Turkey Hills, now the Town of East Granby, Connecticut, 1776-1858, Page 24. Elihu Holcombe was born circa 1773. He was the son of Ahas Holcombe and Hannah Stevens. Samuel Holcombe was born circa 1776. He was the son of Ahas Holcombe and Hannah Stevens. Moses Holcombe was born on 16 January 1780 at Turkey Hills Parish, Simsbury, Hartford Co., CT; Bates, Turkey Hills records the birth on this day but does not name the child.3 He was the son of Ahas Holcombe and Hannah Stevens. Moses Holcombe lived at Hartland, CT.
[S23] Jesse Seaver, The Holcomb(e) Genealogy, Page 48:Item 211.1.V. [S25] Hannah McPherson, Holcombe Genealogy, Page 216.2/Item A-8-4-9-3-2. [S205] Albert Carlos Bates, Records of the Congregational Church in Turkey Hills, now the Town of East Granby, Connecticut, 1776-1858, Page 21. Thankful Holcombe was born on 5 February 1783 at Turkey Hills Parish, Simsbury, Hartford Co., CT; Bates, Turkey Hills records the birth on this day but does not name the child.1 She was the daughter of Ahas Holcombe and Hannah Stevens. [S205] Albert Carlos Bates, Records of the Congregational Church in Turkey Hills, now the Town of East Granby, Connecticut, 1776-1858, Page 23. Lydia Holcombe was the daughter of Ahas Holcombe and Hannah Stevens. McCracken and Seaver do not mention Luther. Bowman notes that Luther was not mentioned in the Simsbury Records. Luther Holcombe was born on 27 April 1744.2 He was the son of Deacon Asahel Holcombe and Thankful Kent. [S65] Deanna Holcomb Bowman Thomas Holcomb, Vol.I:Pg.75. Sarah Kent was born in 1784. She married Asahel Holcombe Esquire, son of Deacon Asahel Holcombe and Thankful Kent, in 1802. Sarah Kent died in 1804. Ashbel Holcombe was the son of Asahel Holcombe and Lucy Holcombe. Ashbel Holcombe married Mary Ann Barber, daughter of Thomas Barber and Percy Merrill, on 5 March 1842. Dr. Donald Barber in his book, page 157, identifies Ashbel, married Mary Ann Barber, but shows him as a son of Peter and Susan (Hoskins) Holcombe. [S25] Hannah McPherson, Holcombe Genealogy, Page 185.1/Item A-8-1-6-8-8-4. 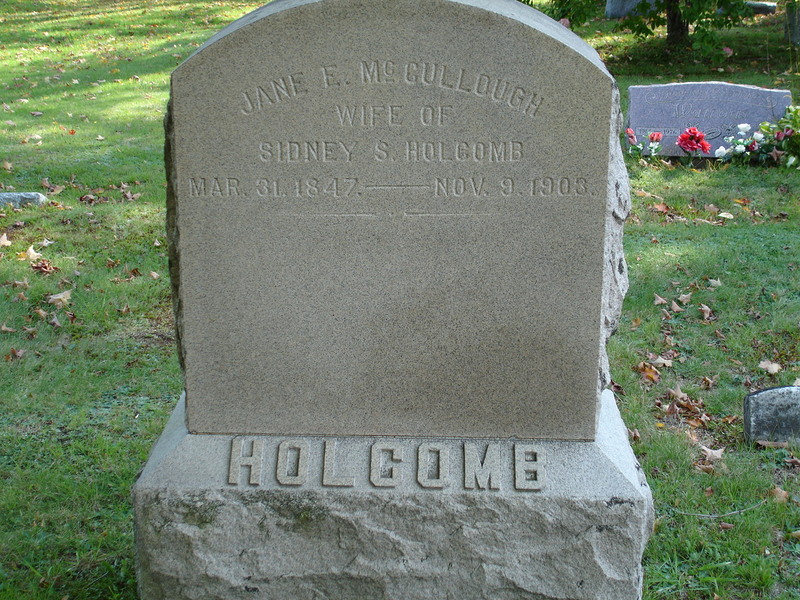 [S807] Find A Grave, online http://www.findagrave.com, Find A Grave, database and images (https://www.findagrave.com : accessed 12 November 2018), memorial page for Jane E. McCullough Holcomb (31 Mar 1847–9 Nov 1903), Find A Grave Memorial no. 76104145, citing New Ohio Cemetery, Belden, Broome County, New York, USA ; Maintained by Colesville Neighbor (contributor 47601677) .